New compact executive cars for 2013 | What Car? The Lexus IS range will expand when the all-new model is launched in 2013. First to arrive will be the all-new IS four-door saloon; it'll be followed by a two-door coupe, while Lexus is also said to be preparing an estate variant - something it hasn't done since the SportCross version of the first-generation IS that disappeared from showrooms in 2005. Shots of a disguised IS prototype show a similar outline to the larger GS, but some of the details are likely to be influenced by the Lexus LF-CC concept car, including slim headlights and a deeply scalloped front bumper. The new IS shares many components with the larger GS, including its basic chassis construction and suspension parts. That should help to improve rigidity and perhaps also allow Lexuss engineers to give the suspension set-up more compliance and sophistication. Lexus sources have told us the new IS won't be available with a diesel engine. Instead, buyers will have a choice of an entry-level petrol engine or a new petrol/electric hybrid system. Infiniti plans to poach sales from the BMW 3 Series with the replacement for its G model range. As part of a re-naming policy for the Infiniti range, the G saloon will become the Q50, while the G Coupe and G Convertible will both carry the Q60 badge. Company insiders have been promising a 'much more dynamic' handling set-up for the new model, and test mules of the car have been spotted hacking round Germanys famed Nurburgring race track for much of the summer. The new Q50 line-up should include more affordable models than the current G saloon range, which starts at around 35k. Expect four-cylinder petrol and diesel engines to cut around 5000 from the prices of basic versions, although the traditional six-cylinder motors, plus hybrid power, will also be offered. 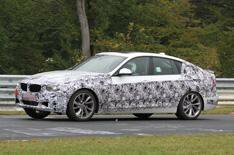 BMW already makes the 3 Series in saloon and estate forms. From the second half of 2013, it will also be selling it as a hatchback. The 3 Series Gran Turismo will mimic the larger 5 Series Gran Turismo by offering a slightly higher driving position and greater practicality than the existing two- and four-door variants. The GT should also have more space than the regular model, particularly for rear passengers, because it sits on a stretched chassis that could also improve ride quality a little. Much of the rest, however, is shared with the standard 3. The engine line-up features the same mix of 2.0-litre petrols and diesels (including, eventually, BMW's new three-cylinder motors), while the transmissions are likely to be six-speed manuals and eight-speed automatics. There will be a price to pay for the GT's more elevated driving seat and its family-shop-sized load space. Expect the premium to be around 2000.